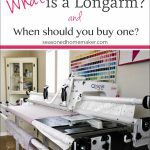 What is a Longarm and When Should You Buy One? When I first began searching longarm quilting machines I was rather disappointed by the lack of basic information. 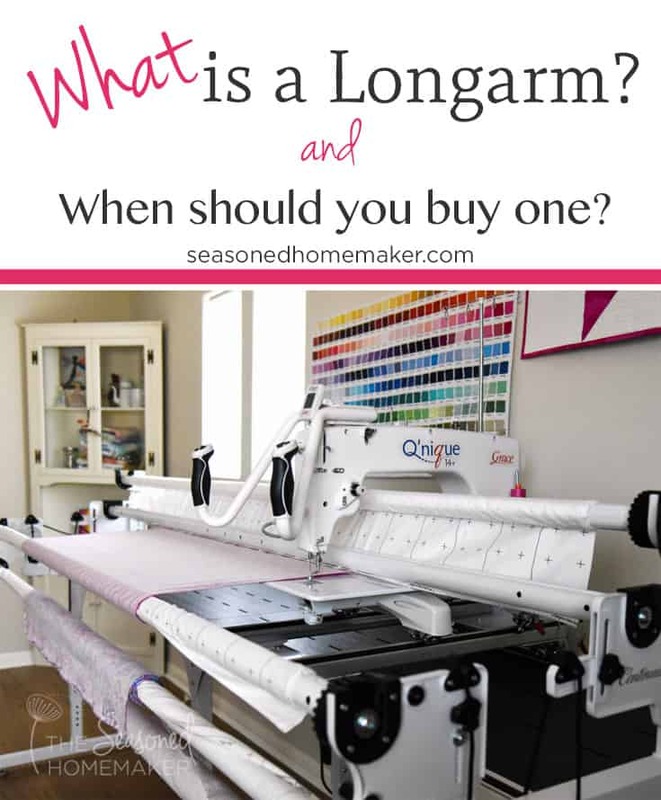 I still remember when I heard the words longarm quilting machine and didn’t know what it meant. This sent me searching the internet for information which left me empty-handed and a little disappointed. All I wanted was basic information and a few photos. My disappointment led me to start a years-long search to collect as much information as I could find and then share that knowledge. When I was growing up in the 70s, my mom had a large hand-quilting frame set up in a dark corner in the den of our colonial ranch. It had small rollers and my mom and great aunt would sit under a harvest gold swag lamp and hand-stitch small baby quilts. As they finished an area, they would turn rollers to advance the quilt and keep stitching. A longarm sort of, kind of mimics this. At its core, a longarm is a permanent frame that allows you to use a machine to quilt a specific area before advancing the quilt. Of course, a lot about quilting has changed since the 1970s. Quilting is now done by machines on much larger frames. 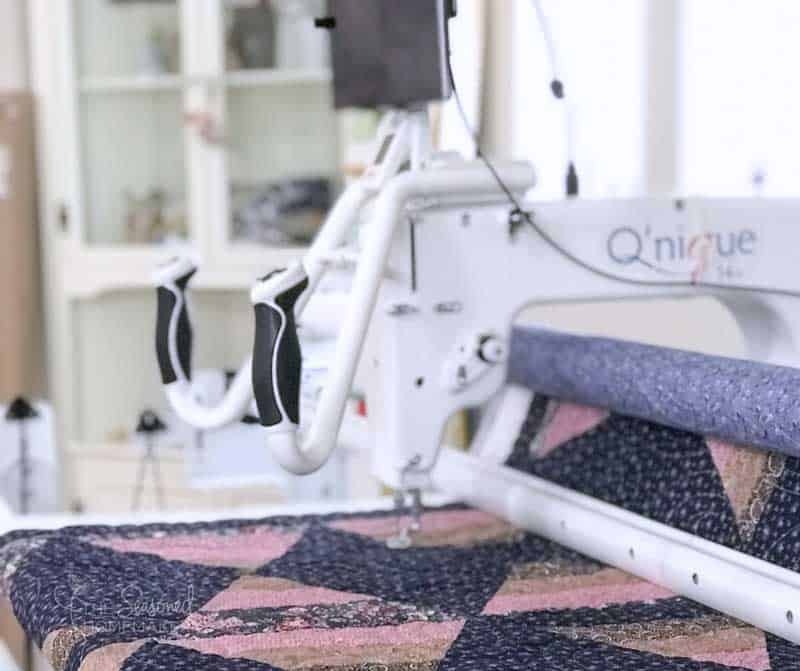 These machines and frames include the latest technology and allow the quilter to stitch beyond her wildest dreams. A longarm is made up of two components: The Frame and the Machine. Most Frames have rollers (or rails) that are for different parts of the quilt. The quilt top, backing, and batting are loaded separately onto the appropriate rollers. It is important to have cloth leaders (affiliate) attached to the backing and quilt top rails. First the backing is loaded onto two rollers. The batting is placed on top of the backing. Next, the quilt top is placed over the backing and batting. This keeps the quilt free of any wrinkles and allows for smooth quilting with a machine. This is especially important if the longarmer is using a computer to do the quilting. Because longarms are so long, I found that before considering which longarm machine you want to purchase you must first settle on a frame. You may want the longest frame they make but not have enough space for it or room to walk around it. Frame width isn’t the only consideration. Frame sizes also vary in depth. A large frame with a large machine will need space in the front and the back. If you plan to use pantographs you will need plenty of room to work from the back of your machine as well as the front. Even if the frame’s depth is 3.5′ you will need at least another 3.5′ of space behind the machine. That means you should allow at least 6′ from a wall or closer to 7′ if you plan to use pantographs. You also have to consider where the longarm will be placed. If you live in a second floor apartment and purchase a large frame and machine, the vibration may affect your neighbors. If you rent, you should first check with your landlord before purchasing a machine. Some frames are height adjustable others aren’t. You will need to consider your personal height and the height of the frame in relation to the handles. Also notice whether the handles are adjustable. Ultimately, your frame size will depend upon the space you have available. Fortunately, frames are no longer limited to ginormous and extra-ginormous lengths. 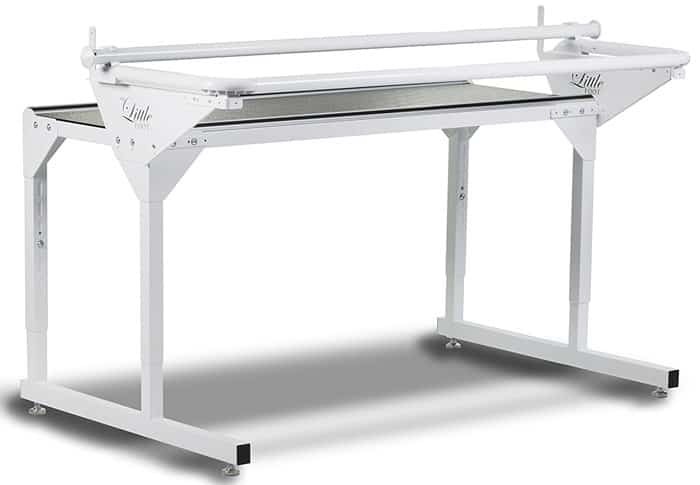 Longarm manufacturers are beginning to recognize the needs of those who want to do a their own quilting and that has caused them to create lots of options. Smaller, 5′ frames are ideal for people with limited space. A good example is the Little Foot Frame by HandiQuilter. (affiliate) Similar frames use the “floating” method to load quilts onto the frame and the quilt is held in place by large clamps or clips. When quilting larger projects there will be a lot of shifting of the quilt. If space is an issue, this may be your only option. Some manufacturers offer frames that can be expanded. My first set up used this Grace SR2 Frame (affiliate) with a domestic Juki TL2010Q. I used this method for several months and didn’t have a problem with it. I originally set it up in a small bedroom. Once I rearranged my sewing space I was able to extend the frame to 10′. If space isn’t an obstacle, then the field is wide open for setting up a larger frame. Keep in mind, not all longarm frames are equal. Frame sizes are designed in to hold different sized machines. A machine with an 18″ throat space will not need the same frame as one with a 26″ throat space. 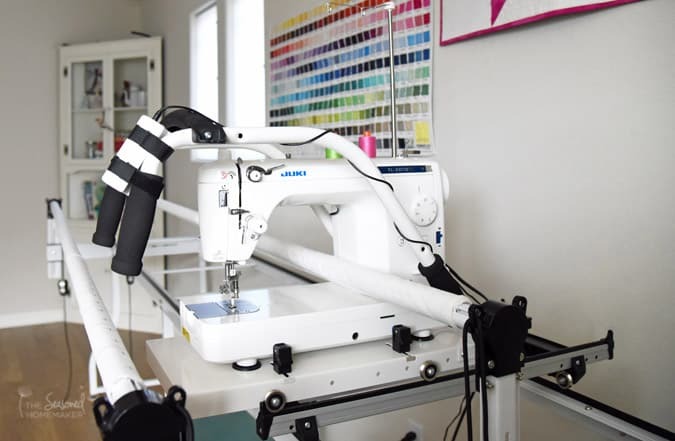 Also longarms designed for commercial use will have frames made from heavy duty materials and could include features like automatic height adjustment and an automatic quilt advance feature. 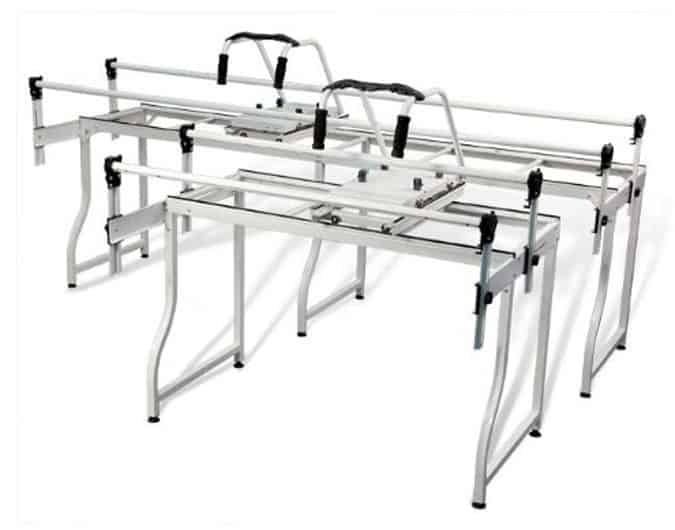 The machine that sits on a longarm frame has three different sizes. For the sake of this post, I’ve used the term longarm loosely, but technically longarm machines have throat sizes of 18″ or more. The throat portion of a longarm machine is the distance between the needle and the back of the machine and is also known as the harp area. Larger throats (or harps) can quilt larger areas without advancing the quilt as often. These machines have a harp space between 7″-9″. The Juki TL2010Q in the image below is a domestic machine with a 9″ harp and it sits on an 8′ two-rail frame. This set up is great for quilting small areas or wavy lines across a quilt. The maximum quilting area is roughly 6″. This is the most economical way to longarm quilt. A mid-arm machine has a throat space between 12″-17″. The size and cost of a mid-arm is a great balance between the short-arm machines and longarm machines. These machines can work on smaller frames and are economical enough for people who want to do their own longarm quilting. Many mid-arm machines are also capable of having a computer for more automated quilting and the expanded throat (or harp) space allows for quilting larger areas. The mid-arm seems to live in that sweet spot between a domestic machine and a true longarm. Mid-arms like my **Grace 14+ (affiliate) now include features such as stitch regulation** and channel locks that were only available on more expensive long arms. *Note: Grace has recently renamed this machine the 15R. **Note: When looking at machines, be sure to ask if the stitch regulation is servo-controlled. Longarm machines have a harp space 18″ and above. A few manufacturers have machines with 18″ throats, but have started moving away from this size in favor of 20″-21″ machines. This jump in size means the price difference between the mid-arm and longarm can be close to double. That said, manufacturers are adding some awesome new features such as automatic tension adjustment and more ergonomic handles. Depending on the amount of quilting you plan to do, these upgrades make the larger machines worth considering. One of the best things you can add to your longarm is a ruler base. It’s ideal for using rulers when quilting, but it also gives you a place to put your hand when your free motion quilting. Below is a short video showing how to use a ruler base on your longarm. I’ve quilted on a domestic machine and have owned both a short-arm and a mid-arm machines. I can say, hands down, that quilting on a longarm frame (no matter the machine) will save you time. There is no laying out huge quilts and either spraying or pinning. All three layers are there in one place. Many longarm dealers rent machines and will give you lessons on how to operate them. This will give you a feel for how these machines operate and whether you are comfortable with the machine. Dealers should also offer classes and maintenance for their machines. For me, I could never wrap my head around sit-down quilting (and let me tell you, I tried). I believe that longarm quilting can be a bit instinctive. For me, the minute I put longarm handles in my hands, it made sense and I could picture my quilting. If this is you, then keep following these posts for more details on the topic of longarm quilting. Thank you Leslie. You’ve answered questions I hadn’t even thought to ask! Very informative. I may never get a long arm but I can dream. I only do the quilting to avoid having a lot of flimsies piling up. I love piecing! Quilting… not so much. In your opinion, what size machine do you need if you only quilt lap size, baby size quilts and table toppers and runners. I think something like the Juki 2010Q on an Grace SR2 frame would be fine for such small projects. I had a long arm and really enjoyed having it. Then we down sized and sold it. 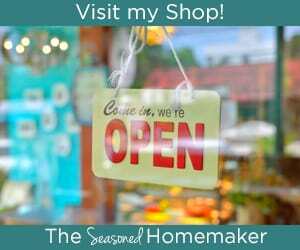 I’ve been thinking about purchasing another and this information is very helpful. Thank you Leslie – you are always very informative. It’s true that once you start quilting on a longarm machine, it is difficult to quilt on your domestic. I am very lucky to have a Quilting friend who has 2 longarms. I can rent time on one of her machines when I need to get some quilts finished! I would recommend checking with your LQS to see if they allow renting time on their longarm. It never hurts to ask! I have used commercial long arm quilters, and still do where I work. They are old and do the basics. I would love to have one of my own but probably never will. I will occasionally take a project that needs to be quilted in to work and then quilt it on our machine. Have never quilted a large quilt on my domestic machine yet. Thanks for all the info. Thank you for the great information. With so many options available, your guidance helps with sorting out the details. Appreciate all your advice! Excellent article, as always, Leslie. I almost purchased a short-arm two years ago but somehow managed to talk myself out of it. I am re-examining my need for one again. We have a quilt show going on this week in a near-by County and I may just go and test drive several models to see what feels right. Thanks, again, for the timely article. I look forward to reading more in the future. Thank you for sharing your knowledge and experience on this subject. I have a sit down long arm. I can’t stand for long times or bend over like I see so many do with their long arms and space was also an issue at the time I bought my machine. Sometimes, I do wonder if I might want a long arm now that I have the space but I still worry about the standing. It seems so tedious to load a quilt on a long arm frame. I can’t get my head around that one yet. Your post was helpful. I am interested in buying a long arm. Is there a comparison of the machines somewhere? Also do you get good deals at the big quilt shows? If there is one, I never found it. I created a Google Sheets doc and dropped all of my info into it for two years. Then at quilt shows and local events I asked a ton of questions and put the answers into the sheet (which I later deleted). Yes, good deals can be had at shows, but most manufacturers offer floor models after both Quilt Markets. That’s the best time to buy – November…after the Houston shows. Vision and would like to down size to a 10’. Any suggestions where to start to do this? Trade in options or a site that might be helpful?? This was a great article and I appreciate any help or advice!! LongarmUniversity(dot)com has a section where you can list your machine for sale. They charge for the privilege, but lots of people look there for used machines. Servo-controlled has to do with how the motor receives the electric current. It’s necessary for stitch regulation. Leslie, I really rejnoyed a test drive of the 15R. What are some things you wish you would have known before you bought it? I don’t quilt large quilts and just starting FMQ and finding it very frustrating and difficult . The 21 just cost so much more, do you wish you had gone bigger? Everyone wishes they’d gone bigger, but I’d have to move in order to get a larger machine. I really, really did my homework so I didn’t have any big surprises. I think the best thing you can do with FMQ is just practice the same pattern every day until you could do it in your sleep. Then do the same with another pattern, etc.